This delightful tale of a knight and a kite maker shows how friendship can overcome envy and how sharing your skills and interests with others can lead to a better outcome for all. With a fun rhyming scheme and vibrant pictures, your little one will be asking for the Knight and the Kites, night after night. Benjamin believes in the power of play and fun and believes they have a strong role in learning and development. As an author, he loves to play with words to create interesting sounds and rhythm even while telling a story with unique and compelling characters. In addition to writing, he is also a hobbyist game designer and lives with his beautiful and patient wife in Burnaby, BC. In The Knight & the Kites, Benjamin has created a wonderful story that reminds the young reader to like who they are and what they do. Friendships, oftentimes unexpected ones, will develop naturally. 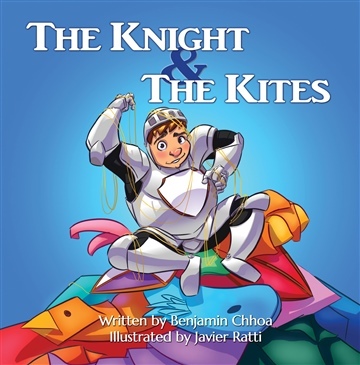 Accompanied by vibrant and action oriented illustrations, The Knight and the Kites offers an engaging read that will want to be read night after night.